I've never seen a leopard seal here. I don't know anyone except grantees who have seen them. We usually just get Weddell seals closer to town. Anyway, this video is incredible. Earlier this year, they found crates below Shackleton's Hut at Cape Royds. Apparently, they contain 100 year old whiskey that more than a few people would love to get their hands on whether they are history buffs, whiskey connoisseurs, or just someone from McMurdo who can't buy hard liquor by the bottle on base and can't wait until the bar opens. All I really know is that they plan on digging (possibly drilling) to get to them. Shackelton's Hut at Cape Royds. 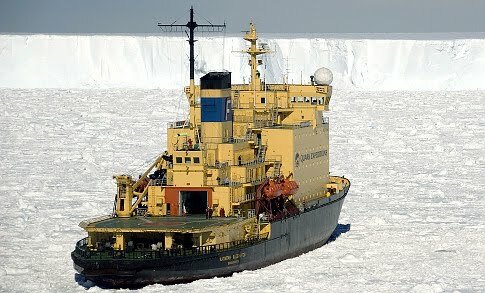 Apparently, another tourist ship is stuck in the ice flow near the peninsula on the other side of the continent. They aren't in any danger and are apparently enjoying themselves. They just need to wait for the wind to unblock the back or possibly for a larger ice breaker to come charging to the rescue.